The compact design of the Smart Elbow deflection elbows saves space — the twelve 6in. elbows shown here occupy the same space as a large desktop. They may also be rotated on their flanges for greater design flexibility and installation ease. 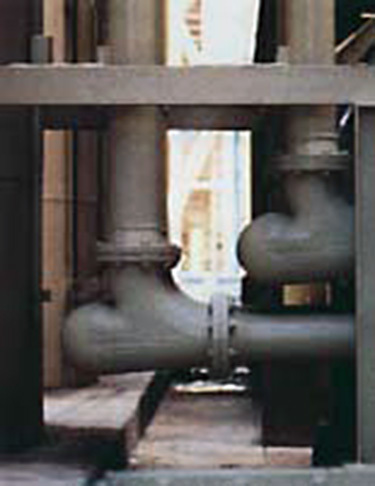 These 95' pipes were assembled on the ground and then stepped into their racks, greatly reducing costly crane time. At Miller Brewing Company's Fort Worth, TX, facility, staff engineer Roy Marin was faced with an interesting problem two years ago — a problem that was solved by using the patented HammerTek Smart Elbow® deflection elbow. The Smart Elbow flow device provides change of direction in pneumatic and slurry conveying systems without the wear, plugging, product degradation or contamination problems which characterize sweep elbow and plugged-tee equipped systems — and does so in far less space. At the very beginning of the brewing process, grain is unloaded from rail cars and sent to storage silos. The automatic diverter that switched the unload line from one silo to another (depending on whether corn or barley was being stored or if a silo was already filled) had been consistently a source of maintenance and house-keeping problems. Miller decided to replace the diverter unit with a new piping panel. And here the interesting problem developed: How to accomplish the intended installation in the physical space available? There simply wasn't enough room for a piping manifold using 4' radius sweep elbows, twelve of them, in the preferred location at the base of the silos. 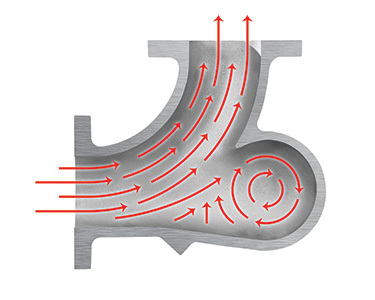 In the process of researching a solution to this engineering challenge, Marin became intrigued by the possibility of using Smart Elbow® deflection elbows. It became clear from the information Marin acquired that they could be an ideal solution. Not only would they meet the tight space requirement, but they would also minimize damage to the hulls of the barley passing through them. Reduced product degradation was an important consideration, as the hulls have a filtration function in the brewing process. The new piping panel was designed accordingly. It incorporates 12 six-inch Smart Elbow models and requires a floor area about 6' wide by 4.5' deep. 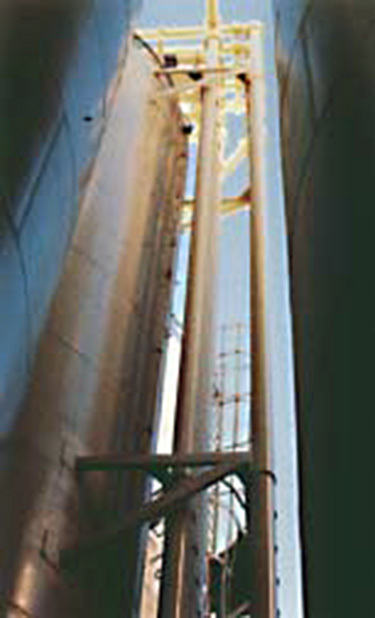 From the panel, a vertical rack containing 12 six-inch pipes in two parallel ranks of six each, rises 95 feet to the top of the silos. There, another dozen Smart Elbow units send the conveyed grain to the appropriate silos for storage. Only three support braces were necessary. The center support functions primarily as a lateral brace because it's not necessary as a load bearer. In addition to making the panel installation possible in the desired location's limited space, using Smart Elbow products has provided Miller's Fort Worth operation with additional benefits. The total installation was completed several days early. It also came in approximately $30,000 under budget projections (the price of the elbows included), primarily due to savings in design and installation time. 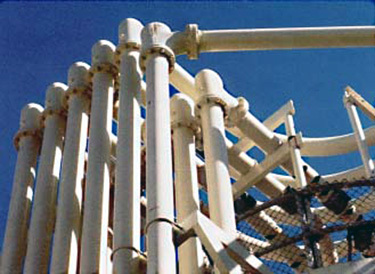 According to Marin and his fellow engineer at Fort Worth, Mickey Brownlow, designing the project was easier because only three supports were needed over the entire length of the rack, and the top elbows could simply be rotated on their flanges to reach different silo locations. Installation was easier and faster because the pipes could be fabricated and flanges attached on the ground. The completed pipe could then be stepped into the rack as an assembly, saving a substantial amount of expensive crane time. In the two years since installation, there has not been a single problem with any of the HammerTek Smart Elbow units. In fact, the spare elbow that was purchased for the panel installation was recently used to replace a conventional sweep elbow that continually wore through in the unload line that feeds the new panel.